REGINA – The Malabar Mission Society (MMS) celebrated its 25th anniversary April 10 at Mount Olive Lutheran Church in Regina, in connection with the society’s board meeting and annual general meeting. Some 45 people gathered for a delicious East Indian dinner catered by Flavours of India, a local restaurant. Rev. Dr. Roland Miller, founder of the Malabar Mission Society, addresses the group on its 25th anniversary. Following the dinner, MMS president Rev. Howard Ulmer led a program that featured three guest speakers. Rev. Dr. Roland Miller, MMS founder, gave some background information on the beginnings of mission societies. While such societies had operated in Europe for some time, they did not gain acceptance in North America until the late 20th century. The sale of a Lutheran church in Calgary made the creation of MMS possible. Proceeds from the sale went to several ministries, and due to the efforts of Rev. Val Henning and others of his congregation, the sum of $41,145.11 was made available for the Malabar mission. Rev. Ron Raedeke, the society’s first president, worked with lawyer Glen Ozem to draft the constitution and documents of incorporation. Some time later the society received its charity status. MMS projects have expanded beyond the original Malabar region of Kerala to include Anantapur in the state of Andhra Pradesh. An offshoot of MMS, New Hope Mission Society, emerged in 2006. “If we have the conditions to go ahead, the Holy Spirit will lead us in the future and will bless us,” Dr. Miller declared. Rev. Carlton Riemer, MMS project officer, used the acronym LAP (as in a race) to describe his goals as he makes his annual trip to India on behalf of MMS. “L” stands for listen: listen more carefully, because India is changing and developing exponentially. Malabar Mission Circle workers are grateful for MMS support but are also caught up in the increasing cost of living as a result of these economic changes. While MMS originally intended to focus only on proclaiming the Gospel, it soon became necessary to help with maintenance and repair of church properties that were damaged by severe weather and heavy rainfall of 300 to 400 inches annually. Strict guidelines must be followed for each request. “A” denotes action: act more boldly. In Kannur MMS is reaching out to young men (Open Door) and to young women (Vanitha) through reading room evangelism. The Society has sent three ESL teams to Kannur with plans to send a fourth to Wandur in October 2015. An online Bible correspondence course is about to begin under Indian management. “P” means proclaim: proclaim more zealously. It takes zeal to proclaim the Gospel that Jesus died for our sins and rose again from the dead. Rev. 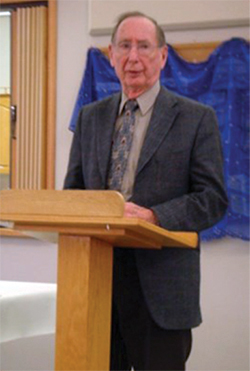 Dr. Robert Bugbee, Lutheran Church–Canada (LCC) president, asked the question: “Why does the church reach out in mission to foreign lands when there is enough work to do in Canada?” In the church, mission work should not be seen as a “frill” after all needs of local congregations have been met. In the mind of Jesus, we are to be His witnesses to the ends of the earth. We are called to spread the good news of the Gospel to our immediate area, to our surrounding areas and to the uttermost parts of the world. LCC reaches out in mission to Central America (Costa Rica, Nicaragua, Honduras), Cambodia, Thailand, and Ukraine. The commitment to Christ of new Christians in other lands encourages us to greater commitment to Jesus Christ ourselves. Nice o know about Lutheran mission in Canada. I am happy to see Dr.Roland Miller who had served in Malabar. As a young girl I served him as research assistant for mopila Muslims of malabar and I enjoyed the ice cold tea they kept offering me. Hope all are fine. One book written by Rev. Roland miller is here in our SBC library, Biharah complex, Manjeri, Malappuram Drict. He has done great job. I would like to be in touch with him if I have his e mail. Rev.K.K.Alavi is my brother in law.